Napkins are mandatory with these Cheeseburger Joes. 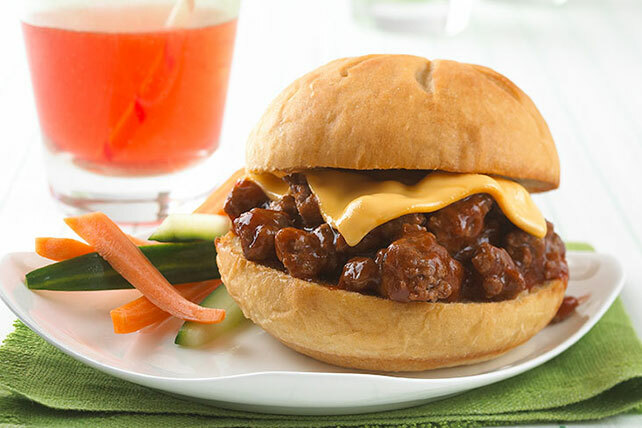 Ground beef, BBQ sauce, ketchup and cheese make up the tasty filling in these juicy sammies. Add barbecue sauce and ketchup; mix well. Cook 5 min. or until heated through, stirring occasionally. Fill buns with meat mixture and Singles. Prepare using KRAFT 2% Milk Singles and substituting ground turkey for the ground beef. Serve with carrot and cucumber sticks.